Have you ever struggled with feeling like a hamster on a wheel? Where one day runs into another? You don’t have any control, and worse, you feel like you will never, ever catch up. Hopes and dreams? Listening to your heart? Who has time for that? You have responsibilities. And so you move from thing to thing. Not really doing what you want to do, but not having the energy to do anything different. Trying to “fake it until I made it” in the middle of complete and total burn out. The thing is, the tool that got me off that treadmill was so simple that even now I almost can’t believe it. I went to a conference. It was one of those business book conferences where the latest authors were presenting their big ideas. I was already exhausted when I entered the auditorium that morning. Too many deadlines. Overwhelming responsibilities. And though the content was inspiring, it all ran together into a big tangled mess of ideas in my head. My brain was full of information, and I walked out at the break feeling overwhelmed. Michael Lagocki scribing at a conference. Suddenly, I could “see” the ideas. The feeling of overwhelm vanished! I knew which ideas went with which speakers. I could visualize what was important and lose the rest. The technique I saw that day is called a lot of different things. I’ve heard the terms: scribing, sketchnotes, graphic recording, infodoodling, and visual journaling. (There’s probably more.) You’ve probably seen videos where a hand sketches the ideas for a talk. I went out and got a cheap composition notebook, a black pen, and some crayons. After that experience, I became fascinated with the idea of taking notes like the guy at the conference. I wanted to experience that same sense of clarity. It didn’t matter that I didn’t have a clue what I was doing. Or that I didn’t have any ability to draw whatsoever. I just started to do it. Messy, imperfect, and 100% mine. Eventually, I had my notebook with me all the time and started using it for everything. Conversations, task lists, things I wanted to remember… One of the most effective uses was just dumping thoughts like popcorn onto the paper whenever I was feeling overwhelmed. There was power in moving the pinging thoughts from my head to a place where they would sit still on the paper. And the doodles, arrows, bubbles, and boxes, gave them form. The color added from the crayons helped me link thoughts together and made it easier to remember. This process of thinking on paper became a tool that seemed to help with everything. And it changed my life. In ways I never saw coming. I learned my eyes are better at prioritizing than my head. One of the problems with overwhelm is that everything becomes a 10 on the priority scale. Suddenly finding my lost pen is as important as the big proposal I am writing. Figuring out what earrings to pair with my suit trumps writing the presentation. Buying a bathmat ranks the same as delivering on a deadline. Stephen Covey’s highly effective habit of differentiating the urgent from the important becomes unintelligible to me when I’m in the middle of overwhelm as tasks swim around my head. I wind up trying to reduce anxiety by doing the most immediate something—even if it is irrelevant to anything that matters. Visual journaling changed that. When I look at all the things written down on paper, it’s easier to make decisions about priority. It created a place my brain could trust to hold things. David Allen—author of Getting Things Done—talks about how our brain pings us when we have open loops. After all, it’s the brain’s job to keep up with all of our pending tasks and responsibilities. Having a place that kept everything made my brain blissfully silent when it came to tasks. Not only that, but adding color and shapes helped me retain the mental image even when it wasn’t in front of me. The person who inspired me to use my notebook for tasks was Ryder Carroll who came up with the Bullet Journal method of rapid logging of tasks. It’s a simple and brilliantly effective system. But even if you just make a list, you will find the notebook gives you relief. As I wrote things down, my brain released them, which turned the pinging off and gave me a peaceful headspace when choosing my next steps. I started to notice what was connected. Before I started journaling visually, I felt like I was drowning in a sea of random, meaningless information and tasks. But once I started capturing it, and reviewing what I’d captured on a regular basis, I saw the connections. Recurring themes began to reveal themselves—especially when it came to things that mattered to me. I learned how much I loved mentoring. I discovered that I’m way more interested in activities with spiritual value. I realized that conversations are where I have the most amazing insights. Visual journaling radically improved my focus. And that shifted my trajectory–which helped me improve my career and achieve quite a few of my dreams. It took me from a head full of someday to feet full of now. We all have ideas. Flashes of brilliance that we are pretty sure we want to accomplish someday. I found that when I wrote them out on paper, I could break them into actionable steps. At the end, I could look at it and decide if it was something I really wanted or not. The cool thing about visual journaling is that you can craft things in a way that helps you link together all the pieces. It gives you a sense of placement and scale that you can’t get when you are processing inside of your head. When you can see steps, everything becomes possible. You can get started on your dream in small ways now rather than putting it off . I started mentoring—even leading the program for one of my favorite organizations. I shifted how I work—which earned me a promotion. I wrote books—even one on visual journaling. It resulted in big business. I know it seems weird that doodles, markers, and a technique that grade school students can pull off would make a difference when there are millions of dollars on the line, but this technique has been radically effective in helping clients have meaningful conversations. When you take what someone says, and convert it to a form where people can see it and interact with it, the dynamic changes. Not only do people feel heard, but it helps them process in real-time. People begin co-creating in the conversation. Honestly, most of the time, the impact is sheer magic for getting to insights that were previously undiscovered. I’ve used sketch notes in client meetings, for professional organizations, and in volunteer efforts. It never fails to improve the outcomes of the conversation—which has resulted in better business decisions and high value for clients. It clarified what I wanted, which oddly helped me get there. I could have never predicted how much clarity visual journaling would deliver on what I actually wanted out of life. Whenever, I had a thought about who I wanted to become or noticed what truly mattered to me, I started writing it down. Over time, clear themes developed. That clarity shaped my reality. It prompted me to invest my resources of time, energy, and money into becoming who I most wanted to be. It yanked me off of autopilot and landed me firmly into a life of intention. The world has a ready supply of shoulds and distractions which we never seem to notice while racing along at breakneck pace. 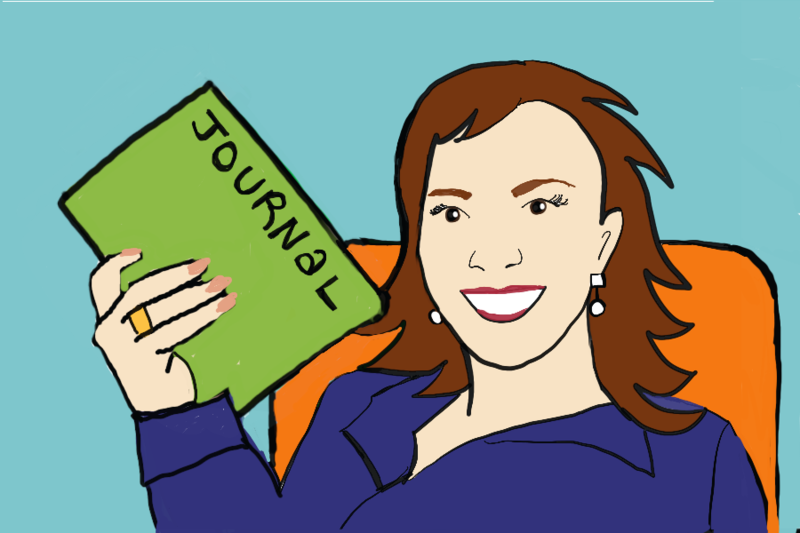 The practice of visual journaling helped me step off the hamster wheel and look at my options and choices. It prompted me to capture what I learned, and led me into a process of regularly reviewing it. And quite honestly, I didn’t even realize this was the tool that sparked it until I started talking with other people who had used this technique and found they have had a similar experience. Remember that conference that sparked this? The artist at the back of the room at that conference was Michael Lagocki. He’s a real artist—professionally trained and a cartoonist by trade. When I look back, I’m still stunned that I even attempted to try the technique. I’m still blown away that for less than the cost of a pen, notebook, and some crayons, I could go from being stressed out to living the life I always wanted. Here’s the thing. You can do this too. Imagine getting off the hamster wheel. Losing that terrible feeling of never catching up. Imagine seeing what your heart is showing you. Imagine noticing the recurring themes in your life and being able to choose what matters most. Carrying a notebook and some crayons (or markers or colored pencils) is so simple. Writing things down is almost effortless. Maybe the simplicity is why it’s power is overlooked. But you don’t have to take my word for it. Just try it for a week. See what happens. Cathy Hutchison helps people find joy and freedom in a world of demands. Her personal journey is a story of learning that the templates we are handed don't always deliver the life they promise. Luckily, she has also found out that we can become who we really are simply by being willing to color outside the lines. Her writing is designed to empower readers to make the choice to live with intention, and her work at YourVisualJournal.com is aimed at helping people leverage the art of thinking on paper to clarify what they want, and then to achieve it. Cathy leads the Mentoring program for SMPS Dallas; has authored three books, including Bad Christian and The Simple Guide to Visual Journaling; and has a vibrant full-time day job as a VP for a team of design engineers.